George Lucaas, film maker extraordinaire and the man behind the new film, Red Tails, made a stop to 'The Daily Show' last night. During his conversation with host, Jon Stewart, he touched on the difficulty he faced in getting a film staring an all black cast made in Hollywood. Even with all his prestige (this is the dude that brought us 'Star Wars'), he still struggled to get Hollywood studios to buy into the idea of making a film about the Tuskegee Airmen because it stared an all black cast. Well in order to get the film done Mr. Lucas decided to invest almost a $100 million of his own money into the film. 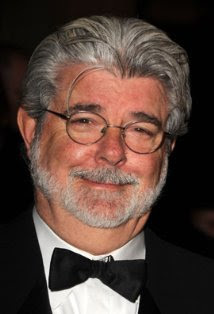 It's amazing that someone like George Lucas would struggle to have a film made. A story like this gives you new found respect for someone like Tyler Perry. He made not give you the depth in a film that you are hoping for, but the fact that he is capable of getting films made period is very impressive. Now most of us commoners don't have $100 million to invest in a film, but there has to be a way for us to tell our stories without being slaves to Hollywood studios. I definitely will be going to see Red Tails on opening day. I hope you would do the same. Yeah. Hollywood just doesn't get it. But you can tell they have a limited budget. Considering the film opens in 10 days, I saw the trailer on tv for the first time this past weekend. And I just saw another clip within the past ten minutes. It was probably only 5 seconds long. If you blinked, you'd miss it. I am spreading the word about it. I surely hope this will not be another Akleea and the Bee. You know how we don't like talking about or watching movies about our history or seeing films of substance. I will be going to see it. Tyler Perry is able to put most of his movies on the big steen because he keeps the buffunery and keeps giving fuel to ignorant people ammo. You do make a good point. People like to claim it's all about the money, but even when blacks films like the Color Purple have good ROI, you still don't see Hollywood jumping on the gravy train. You also don't see those stars go on to other pictures. Heck you can be black in Hollywood have a hit film and still not have another picture scheduled, or script sent to you in years. You will notice that some types of films starring blacks have almost no trouble getting made. Buffoonish comedies. This is really rather funny if you consider that back in the 70's right toward the end of the blacploitation phase Hollywood exec's said that blacks didn't want to see comedies. Let's just face the facts that Hollywood doesn't have a clue about anything when it comes to making films about any other ethnicity except the lives of white people.